"I hope one day, and I pray one day, that we are going to reduce maternal mortality in Zambia. I’m involved in reviewing maternal death records, and many times you discuss, 'Was this a preventable or a non-preventable maternal death?' Most of them are preventable maternal deaths." Rhoda Amafumba has been working as a dedicated midwife and nurse for more than 25 years. She works at the university teaching hospital in Lusaka, Zambia. The leading cause of maternal death is obstetric hemorrhage, when women bleed to death before they get the care they need. 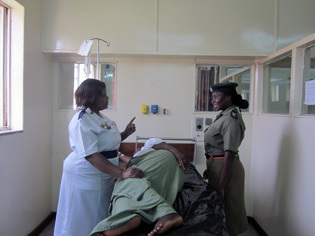 Rhoda trains midwifes in use of the LifeWrap, a groundbreaking first-aid device that saves mothers’ lives. IMOW: Rhoda, can you tell me how you became a midwife and an advocate for maternal health? Rhoda: I believe it was a calling. Seeing a delivery for me, if you’re a Christian, it makes you feel connected to God’s creation. The feeling when a baby has been delivered, before the parents see the baby and you are the first person to see the baby brings so much excitement, and you just feel like continuing to do the best you can for this mother and the baby. IMOW: Kind of a labor of love? RHODA: I’m supposed to work from 7:30 am to 4 o’clock pm. But believe me, it’s almost impossible to leave at sixteen hours. It’s almost impossible. Sometimes when you are just thinking of leaving the ward, that’s when probably you have PPH (Post Partum Hemorrhage) coming, that’s when you are having a patient who is havingeclamptic seizures, how can you leave the patient? You just continue working. The night nurses sometimes left me in the morning, then they come back for work at 6:00 pm and they find me; I’m still in the ward. IMOW: What exactly is the LifeWrap, and how does it work? RHODA: The LifeWrap is sometimes compared to a wet suit—like you would use in diving underwater. It’s a non-pneumatic anti-shock garment (NASG), a neoprene compression first-aid device that is designed to stop bleeding and maintain blood pressure. A nurse can wrap it tightly around a woman who is bleeding and save her life. Sometimes you’ll have a patient that has come from a rural clinic and she’s bleeding,nd you have to manage to control this bleeding, and this patient is in shock. And there’s no blood for transfusions sometimes, so what do you do? This is where this garment has become so handy. You apply the garment, and instantly the vital signs improve. It gives you chance to run around, to look for blood, to call for donors. It gives us more time, so that we can find blood and we can transfuse this woman. IMOW: Such a simple, but profound way to save a life—do patients recognize this? IMOW: What are your most challenging times? Rhoda: If you walk in the morning and the ladies in the night had a maternal death, as you enter the ward, you can tell things are not fine. Because whatever food the ladies carried for their night, you find it packed on the table. And you look at their faces, they are gloomy. I ask them if they are okay. They say: “We are not fine, we had a maternal death.” Everybody is sad. It’s very, very frustrating when we know we can save their lives. We all know they need not die, what is killing them is preventable. IMOW: How do you encourage your student midwives? Rhoda: I urge the midwives to do their best. I know they work under very, very difficult conditions. But at the end of the day if you are able to save a life, it will make you happy. It’s saving the lives of these women that we chose to care for that will make us happy. IMOW: Tell me something about yourself that you think people would be surprised to hear. Rhoda: Sometimes I joke that—and I’ve actually told this to the girls who I work with—if somebody came here from home and found me running around in this labor ward, they would be surprised because I’m actually a lazy person at home! IMOW: I find that hard to believe, clearly you work very hard! Special thanks to Dr. Suellen Miller, Director, Safe Motherhood Programs Bixby Center for Global Reproductive Health and Policy, for conducting this interview for IMOW. 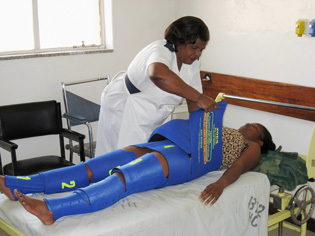 Help Rhoda in her work to improve decrease maternal mortality with midwifery training and use of the LifeWrap.